While Disney-Pixar’s film Finding Nemo tells a fantastic story involving a father fish, his son, and the ocean, Nemo’s lucky that the plot of the film didn’t involve him being flushed down a toilet in a suburban home. If it had, Nemo would’ve undergone a crucial Odyssey before even reaching a river: he would’ve journeyed through a municipal wastewater treatment plant. While a jaunt through a municipal wastewater plant doesn’t sound as commercially attractive as adventuring through the ocean, the purity and quality of municipality waterways and their ecosystems depends on municipal wastewater plants’ implementation of standards through treatment, via an air-tight water purification process. 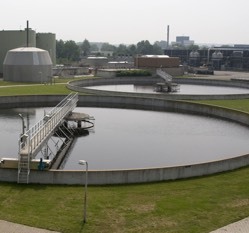 The goal of a municipal wastewater treatment plant is to act as a gateway between contaminated wastewater and the water sources where the wastewater eventually goes. For that reason, many wastewater treatment plants are built in low-lying areas, usually with easy to access to water sources, such as river. All the water which leaves the plant after processing, called the ‘effluent’, needs to meet a standardized level of quality. The Environmental Protection Agency (EPA) estimates that there are around 16,000 municipal treatment plants active in the U.S. today; all of them need to meet the same environmental requirements in terms of their treatment quality. The primary treatment in the process utilized by municipal plants reduces solid objects and suspended solids in the water via a barrier – otherwise known as sedimentation. Nemo, unfortunately, probably wouldn’t’ve made it past here. The process aims to reduce the presence of solid objects, pathogenic (disease causing) bacteria, biodegradable organics (BOD’s), and excess nutrients found in the wastewater. Primary, or mechanical, treatment filters the solid objects, while secondary treatment focuses on biological elements of the water. According to the World Bank Group, 85% of BODs and associated solids are eliminated by the conclusion of secondary treatment, which correlates with the EPA’s standards and their emphasis on plants having thorough, precise, and controlled secondary treatment systems. Tertiary treatment systems are becoming more popular in plants, as the advancement of technology leads to an even more robust cleanliness demand. Especially at the tertiary level, valves are essential because computer-based instrumentation can open, close, and/or partially close valves to ensure that purification is correlating with process control. The process controllers use level and pressure measurement instruments to evaluate the quantitative and qualitative aspects of the wastewater. The pressure and level sensors indicate that the treatment systems are functioning properly, but also that the water moves from station to station in the plant with the most efficiency and care. If the instrumentation being monitored by plant employees is incorrect, a glitch in the system could lead to a decrease in the quality of the effluent water, resulting in damage to the environment. The process technology and its controllers must be both automatically and manually sound, because reliable operators need a reliable system to produce a top-quality result. Sorry, Nemo, the sequel isn’t taking place in a municipality anytime soon! We just added a new welcome video for our Ives Equipment YouTube Channel. Check it out.